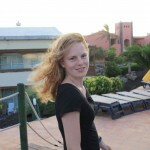 This year Carmen and I went on a holiday to Lanzarote, the easternmost island of the Canary Islands. 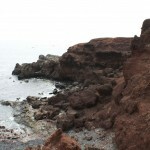 It’s a relatively small island located in the Atlantic Ocean, just a bit more than 100 kilometers west of Africa. 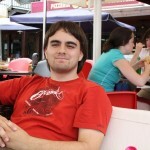 We left home very early in the morning on Wednesday July 15th and arrived at the hotel around noon. 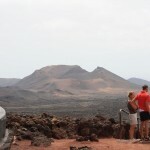 One of my first impressions of Lanzarote was that it’s very lifeless, there’s very little vegetation, and I didn’t really like the architecture of the houses I saw on our way to the hotel. 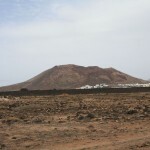 All the houses on Lanzarote are white, which is a huge contrast to volcanic landscape. They really stick out in a very harsh way instead of blending in with the environment. 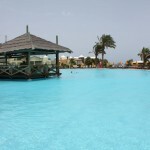 We staid for one week at H10 Rubicon Palace, a nice 4-star hotel in the Playa Blanca area in the south of the island. We had to wait an hour or two before we could enter our room as it still had to be cleaned, so after checking in we had a quick look around and went to the pool bar to get a drink and grab something to eat. My first impressions of the hotel were pretty good, although it’s pretty huge and took some time to figure out were everything was located. 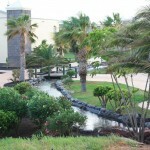 The hotel had a nice garden, a total of six pools, lots of facilities, and friendly people. There was some noticeable wear and tear, like some broken tiles or walls that could use some paint, but overall it’s a pretty good place for its price class. An hour or two later we picked up our key at the reception desk and went to unpack our bags. 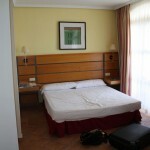 The room was pretty nice, it was spacious and had a large balcony with lateral sea view. Afterwards we went to the main restaurant to eat dinner, they always served all-you-can-eat buffets. Each time they served different things and there was always a very wide variety of meat, fish, pasta, vegetables, fruit, and more. For dessert there were usually about six different pies and various ice cream flavors as well. IMO the food at Rubicon Palace was better than what they served at Garden Resort Calabria last year. 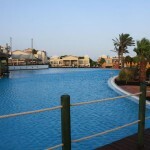 The resort has six adult swimming pools and some shallow pools for little children. We spend most of our time at the main pool which was pretty huge, but mostly there weren’t too many people in the pool because the water wasn’t too warm. 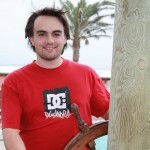 We didn’t have a lot of luck with the weather during our stay, for half a week it was rather cloudy and very windy. I knew there was a lot of wind on Lanzarote, but one day the wind was so strong that even some pool chairs ended up in the pool! 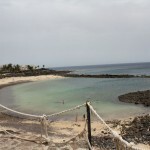 The Canary Islands are sometimes described as the isles of eternal spring but we were only blessed with good weather during about half of our stay on the island. I believe it was usually around 25°C, when the sun was shining it felt hot but when it was cloudy it sometimes got a bit too cold due to the wind. 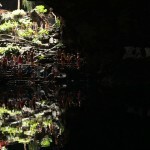 Therefore not too many people dared to take a swim in the pools. One of the smaller pools was supposedly heated, but I couldn’t really tell the difference with the other pools. 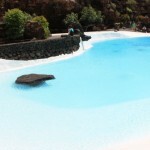 One more thing about the pools, there are no freshwater sources on Lanzarote so the water in the pools is treated seawater. You have to make sure you don’t get any in your mouth because the water has a very disgusting taste. 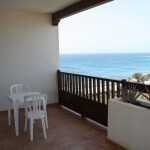 H10 Rubicon Palace is located next to the sea and it’s a bummer there’s no nice beach attached to the resort. 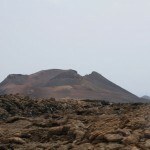 The coastline is pretty rock with lots of height differences and there’s a very nice view from the hotel, it is overlooked by a dormant volcano and when the weather is clear you can easily see Fuerteventura and Lobos in the south. There was a tiny sandy beach a quarter of a kilometer from the hotel, but the first beach worthy that name was a 1.5km walk away from us. 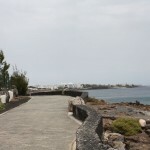 Fortunately, there is a pleasant kilometers long promenade next to the hotel that takes you all the way to the small town of Playa Blanca. We went to this village once, it was a nice walk but there wasn’t really much special to see or to do there. 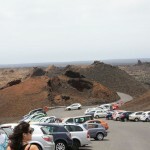 To get the opportunity to see most of the main attractions on Lanzarote we did the grand tour of the island on Tuesday. 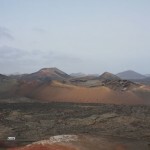 A bus picked us up at the hotel at around 8.40 a.m. and one of our first stops was in Timanfaya, a volcanic national park, at the dromedary station. 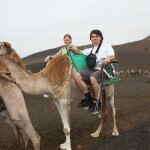 There we had the opportunity to take a ride on a dromedary. 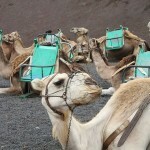 There are about 200 dromedaries on Lanzarote, in the past they were used in agriculture but these days they are mainly a tourist attraction. 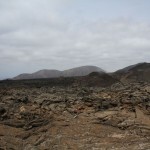 The ride through the volcanic landscape was fun but not really comfortable. The next stop was at a wine cellar in La Geria where we could taste some wine. Vines are cultivated in a very unique way in La Geria because of the hostile environment and extremely low rainfall. 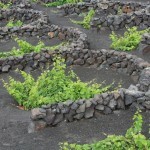 There are thousands of small pits in which vines are grown in volcanic soil, which enables the plants to receive water from night time humidity. 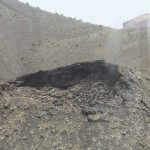 Each of these pits has a low, curved wall to protect the vines from the wind. 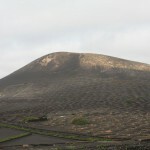 No machines can be used due to this unique cultivation method so the production of wine in La Geria is very labor intensive. After tasting some of the sweet Moscatel wine we went to the highest mountain of the island (about 670m high IIRC) where we were literally in the clouds. We didn’t have a nice view of the valley, but it was a pretty unique experience to see the clouds moving around you. Just below the peak of the mountain is a bar where we had a drink and bought a snack. Afterwards we went through the Valley of 1000 Palms and crossed some small villages. 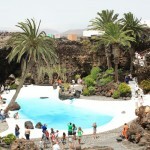 One of the must-sees is Jameos del Agua in the north of Lanzarote, it’s part of a volcanic cave system and was shaped by the island’s famous artist César Manrique. The caves are several kilometers long and in earlier centuries they were used by inhabitants to protect themselves from pirates. These days a small part of the caves are open to the public, after climbing down a stone stair you come across a cave with a natural salt water lake. It’s home to a species of tiny blind albino crabs. A bit further is a collapsed cave which Manrique turned into a spectacular looking oase with a crystal clear blue pool and a tall palm tree. Swimming is forbidden though, it was allowed in the past but no longer allowed due to the high number of visitors. One of the other caves is host to an auditorium where music concerts are held, and there’s also a museum about volcanism. 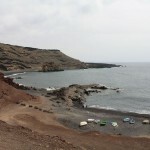 After our visit to Jameos del Agua we crossed the island again and stopped in Mancha Blanca for dinner. A buffet was served for us but unfortunately there wasn’t really a lot of choice. 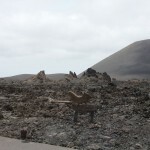 This town has a church which was built in honour of the Virgin Mary, as locals believe a large statue of the Madonna saved the village from the lava flow of a 19th century volcanic eruption. 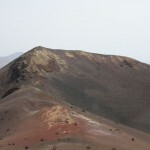 After dinner we went to the Timanfaya National Park, this area of the island is just a few hundred years old as it was mainly shaped by violent eruptions in the 18th century. 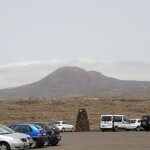 The icon of the national park is the El Diablo statue by César Manrique, as all hell broke loose in this region. The national park is a very dead area, it has a moon-like landscape with very little vegetation and no wildlife save some birds. 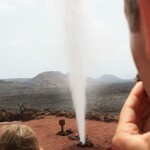 The first stop in the park was at the restaurant, where you can see several demonstrations of the hot underground temperatures, we were told temperatures of up to 600°C can be found at a depth of little more than 15 meters. 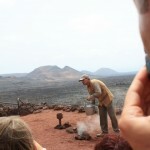 First you literally get to feel the heat as one of the employees hands over some soil which he just dug up at a depth of just 30 centimeters, most people dropped the volcanic gravel pretty quick as it had a temperature of around 60°C. Next they showed how easy it is to make a fire but the most impressive demonstration is when they pour a bucket of water into one of the steel pipes, the water blasts back out two seconds later as an impressive geyser! 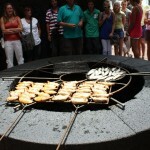 Another impressive attraction is the volcanic BBQ in the restaurant, it uses nothing more than the volcanic heat to grill meat and fish. 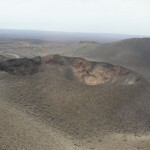 Next we received a half hour long bus tour of the park during which we got a very close look at the volcanic landscape, the lava rivers, a collapsed lava tunnel, craters and more. It was pretty impressive, even though we were never allowed to leave the bus. 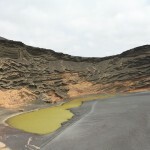 The final stop of the tour was El Golfo, this is a small green crater lake surrounded by cliffs. It gets its remarkable color from algae. Half an hour later we were back at the hotel, we took a quick dive into the pool and started packing our bags as we had to leave on Wednesday. 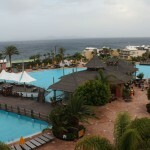 Overall we had a nice stay and I can definitely recommend a visit to Lanzarote.